Tory Historian has been reading the small World's Classics edition of James Woodforde's diary, entitled Diary of a Country Parson and fell to wondering whether any research has been done about the country parson and his family. The heavily edited tiny book is fascinating and frustrating in about equal measures. Well, Mr Google is everyone's friend, even Tory Historian's. 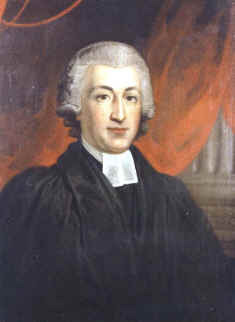 There is, thankfully, a Parson Woodforde Society, which appears to be flourishing and has produced a number of works about the man himself as well as publishing his complete diary in 17 volumes. How can one find time to read them all? 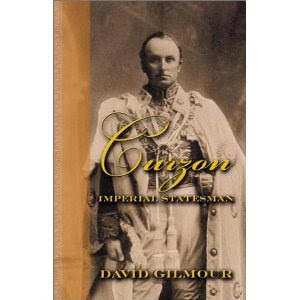 Curzon's reputation thus survived the first two verdicts of history. In the early 1930s, however, Lord Beaverbrook launched an assault on it that lasted for nearly 30 years and ensured its virtual destruction. In a series of racy and tendentious books the newspaper tycoon directed a crescendo of abuse culminating in the allegation that his victim had been 'inconsistent, unreliable, untruthful and treacherous'. His principal charges were that Curzon had 'changed sides on almost every issue during his long career' and that he had given Asquith 'an absolute pledge' that he would not serve under Lloyd George in 1916. Beaverbrook's judgements were accepted with a strange lack of inquiry by some distinguished historians, who repeated his statements and in some cases developed them so that it soon became almost obligatory to describe Curzon as a 'turncoat' or 'deserter' always joining the winning side. Pre-eminent among them was A.J.P.Taylor, who portrayed him as 'one of naure's rats', a weak and irresolute figure who in 1922 'deserted Lloyd George as successfully as he had deserted Asquith'. Another highly respected scholar, A.M.Gollin, took up the theme of Curzon's 'political somersaults', claiming that before the First World War 'he often advocated certain definite policies, only to change his mind at the last moment and reverse his course'. These are particularly odd charges as in his own lifetime Curzon was often attacked for being too inflexible. It was not till the late 1960s when Kenneth Rose published his biography of the late Viceroy and Foreign Secretary and David Dilks his two volumes on Curzon in India that there was even a partial rehabilitation. We then went through a period of too many historians refusing to see anything good in an unashamed imperialist, despite his interesting and sensitive descriptions of Persia and Central Asia and his well known determination to preserve Indian culture. Why exactly would any reputable historian follow the lead of a somewhat disreputable newspaper magnate in historical matters? Tory Historian's absence has been occasioned in part by interested reading about the debates in the Conservative Party in the early twentieth century (of which more in future postings). The return was going to be a happy one, perhaps with a note about the fact that today is the great Benjamin Franklin's 305th birthday. Instead, TH is furious. How can one not be when one of the main Sunday newspapers publishes a sycophantic interview with Eric Hobsbawm, the historian who has been a member of the CPGB all his life, who still regrets the collapse of the Evil Empire a.k.a. the Soviet Union and who, undoubtedly, tailored his historical writings according to his ideology. Do these people have no shame? Arthur Boutwood's book naturally led Tory Historian to the work of E. H. H. Green, the historian of the Conservative Party and its ideas, who died tragically young in 2006. His Ideologies of Conservatism denies that the Conservative Party is a party with no ideology. Its beginning, much to Tory Historian's delight, is an account of the fierce ideological battles waged within the party when it appeared to be in crisis in the early years of the twentieth century. There were, of course, Conservative policies, but there was no productive Conservative thought, certainly no systematized Conservative thought. The changes which created our modern political world were governed by conceptions which were not Conservative, and were brought about by forces which owed none of their strength to Conservative ideals. The answer is 1913 in a book called National Revival - A Re-statement of Tory Principles by Arthur Boutwood, apparently anonymously though it was hardly a profound secret. Tory Historian is aware that "awesome" has become one of the most fashionable slang words meaning, roughly speaking, "pretty good". This is rather a pity as the word should be used only when describing people like Captain Frederick Gustavus Burnaby (1842 - 1885), modestly described by Wikipedia as a "traveller and soldier". And so he was, as well as a superb writer of two classics of travel literature: A Ride to Khiva and On Horseback Through Asia Minor. His biography (which included unsuccessfully contesting a seat in Birmingham in the Tory-Democrat interest) is one that could not be invented. 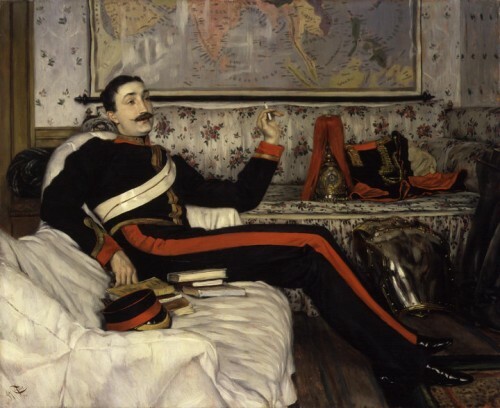 Only reality can produce so much activity in one person, who also found time to sit for a wonderful portrait by Tissot that is in the National Portrait Gallery. Who could possibly believe that the languid young man stretched out in that portrait could have achieved all that he had? Here is a little more about his literary work. 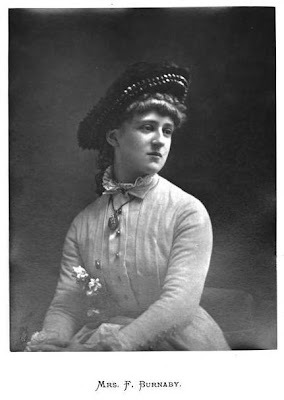 Thanks to one of Colonel Burnaby's admirers who is also a reader of this blog, Tory Historian has found out about Mrs Burnaby (1860 - 1934) who became later Mrs John Frederick Main and Mrs Aubrey Le Blond. She seems to have been as awesome (in the true sense of the word) as her first husband, becoming a leading mountain climber and the first President of the Ladies Alpine Club. She wrote about her mountain climbing under her different married names and made a number of films of snow sports in the Alps. She is generally considered to be the first woman film-maker. Le Blond evidently did not think her filmmaking of any great significance as she fails to mention it in her autobiography, perhaps because her life encompassed so many other activities: as well as writing and photographing, she lectured, travelled widely, worked in the Service de Santé Militaire in the First World War, and was made a Chevalier de la Légion d’Honneur in 1933. Tory Historian can only regret that the lady did not turn her attention to British politics. She would undoubtedly have been a Tory like her first husband. Tory Historian rarely makes predictions (better not say never but hardly ever will do). One reason is the silliness of predictions found in many books. Books on politics, particularly those that deal with slightly volatile regions are notorious - the vagaries of publishing are such that by the time a book comes out everything would have succumbed to events. Even more entertaining is reading confident predictions made by critics of yore. Take H. Douglas Thomson's Masters of Mystery, which TH finished on New Year's Eve (with some sliding into 2011). There are several predictions in it, some more serious than others, which are very funny. Among them there is the highly contentious but clearly tongue-in-cheek assertion that the detective story cannot develop as it has already reached perfection. As Mr Thomson himself seems less than impressed with a number of the Golden Age classics, this is clearly a jocular farewell to the reader. Of more seriousness is his contention that Miss Marple, Agatha Christie's greatest creation, has no real future as a detective. Ha! Even more peculiar is his assertion that with the growth of historical teaching and scientific exploration of evidence historical fiction has had its day. It is possible, that the lack of historical teaching has reversed that trend but TH is very doubtful that it actually happened. Not only has historical fiction been flourishing, it has spread into what might be called literature (with Hilary Mantel's Wolf Hall about Thomas Cromwell winning all sorts of literary prizes) and into detective fiction as well with very many detective story writers deciding (often unwisely as has been pointed out on this blog) to set their tales in past times.